On October 21st 2009 I posted “Amazing Pictures, Pollution in China” featuring the winner of W. Eugene Smith Grant in Humanistic Photography, Lu Guang’s documentary project “Pollution in China”. This post was an instant sensation that attracted viewers from all over the world. In less than 20 days, this post was viewed by over 475,000 unique visitors in 204 countries with over 510,000 page views. As for today it had 3,327 retweets on twitter and 929 comments. Thank you everyone! It was both surprising and inspiring to see how much people around the world cared about the pollution issues in China and the environment of the planet earth. And of course Lu Guang’s haunting photos were truly breathtaking. His artistic and insightful work of art exposed real urgent issues of people living at the bottom of the society in China, the side of China people of the world usually don’t get to see. But how did Lu Guang take these photos? And what was his experience going to the polluted areas? Lu Guang shared some insights in an Interview with NetEease. The topic of the talk focused on what was behind those photos – the residents living in those polluted areas. As a photographer who directly contacted and interacted with these villagers, Lu Guang described how the villagers saw the pollution issues. NetEase: Where did you get the funding for your project? 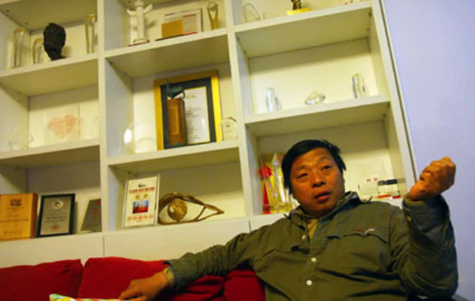 Lu Guang: They were my savings. I am different from other people, I make 50,0000 and fell it’s enough, other people make 100,000, 1,000,000 still don’t feel enough, and still continue to make more money. But my thinking is different from other people, I wish my life to be simpler, for example yesterday I could have flown back, how much would it have been? 690. How much was it taking the train? 210 yuan for the whole night, for sure I chose the train. Considering my health, I should have taken the plane, but I don’t have that much money. I must save money when I can. For example, other people stayed at hotels that cost 200, 300, 500 (yuan), the hotels I stayed at were all under 100 (yuan). NetEase: How did you find and choose the locations of your photos? Lu Guang: The information was all provided by friends. NetEase: There are many polluted places, how do you choose the order of your visits? Lu Guang: Continuously travel and constantly work. Every place I went, there were always friends helping me, I gave my phone number to him, he also gave me his. Whenever something happened over there, he would call me, and I would go over there right the way. Of course there were times I couldn’t make it over there. NetEase: You said you ate and lived with the villagers, what were most of the reactions of the villagers living in polluted villages when talking about pollution? Lu Guang: Whenever talking about pollution, they would become very talkative. NetEase: They want to tell you things? Lu Guang: Yes, including “Hong River flows through here, 20 years ago the river was very nice, there were fishes, we all bathed in the river, and used water to irrigate wheat, but now we cannot do that anymore. And for so many years we have talked about it many times. We reported to the government, but nothing was ever resolved. Therefore we are now numb and don’t want to complain it anymore.” They were very miserable. NetEase: The places you shot at where you think the pollution was very serious, how did the villagers see the pollution in their lives? Did they feel the pollution was very serious and threatening their lives or (that the polluting industries) driving the local economic development was more important? Lu Guang: In fact, there is no economic development for them, it only brought them destructions. Back then they had fertile fields. There were many water conservancy facilities built in the 70’s, all were every good, used to irrigate the fields. But now, pollution came and the water could not be used to irrigate the fields anymore. After a long time, now all the water conservancy facilities are wastes. The polluted water has led to contamination of the underground water. All their drinking water is underground water, water in the wells or from the water tower. Water from water tower flows straight to their homes, unlike us, the tap water we drink is already processed. Drinking this kind of water for long time, many people got very ill. I interviewed a village 3-5 kilo-meters away from Hong River village and asked them if there were people with cancer there. They said yes, but only 1-2 in couple years, and very few. However (in Hong River Village), they have a dozen in each year. The difference is obvious from the same district. NetEase: How did Hong River (region) village head see the water pollution in his own village? Lu Guang: This is not their problem because it is upstream, a county, a city where people dump sewage and flow to them. What I am talking about is (Hong River region) Zhang Yu Zhuang village. The head of the village was very helpless, they repeatedly reported the issue to the town and county government, but it was never resolved. Even the county could not resolve it because the water is not dumped by them, it was another county, another city that was dumping sewage, they couldn’t do anything. NetEase: if factories were set up in those areas, the villagers who benefit from it, for example family member works at the factory, what are their attitudes (of pollution)? NetEase: How does the county government see the polluting? Lu Guang: They are already numb, they cannot do anything. So many young people all have escaped and did not want to return. Young people going out to work all did not want to come back, many lived outside. NetEase: Living in polluted areas, what specific actions reflect these villagers’ environmental awareness? Lu Guang: The villagers have no way of protecting the environment. They are the victims, drinking contaminated water every day. They have no choice, unlike wealthy people can buy mineral water, they cannot afford it. NetEase: What do you think the crux of pollution is? What is the root cause? Lu Guang: The root cause of pollution is (businesses) want to get more profits, business owners want to get more profits, put aside their own moral and destroy environment. They gained more profits, and that’s it. NetEase: Is it that they don’t have the rights to hold talks equally? The polluter and the people do not have the equal rights to communicate? Lu Guang: Who do you talk to? They let you talk? Do you know what they see the farmers as? I should bring you to see what kind of people farmers are. I am telling you, they totally look down on the famers, the true poor people. When you go to the front line you will feel it, the local farmers are suffering in poverty. The right to talk is not for them, it is for the rich people. They (the rich) got the right to talk, not the famers. NetEase: You took so many pictures of pollution, what do you think the best solution for pollution is? Lu Guang: If China really wants to solve the pollution problem, I personally feel that it does not depend on a few people from Environmental Protection Administration (EPA), nor relying on the public to report. I personally think that it is a matter of law, because in China’s “Environmental Protection Law”, the maximum fine is 500,000 yuan, with no criminal responsibility. For a company with couple tens and hundreds of millions yearly profit, what is 500,000? Go ahead fine me, it’s ok, because the cost of processing sewage is not 500,000, maybe is millions, it’s ok to give you 500,000. Therefore it is useless to only impose a fine. It is necessary to hold criminal responsibility and to develop more strict laws. As a legal representative, an owner, if strict laws target him, he will certainly care more about his business. There is no need for the EPA and supervision by the public. If companies who were found of dumping illegally or reported by someone of polluting get the prosecution sentencing, no one will dare to do it anymore. Just because our law is weak right now, the fines are no big deals to the companies. They will pay you as much fines as you want. NetEase: Do you feel that your photographs have impacts (on people)? Lu Guang: As for the impacts of my photographs, in fact I didn’t feel it when I was shooting them. Lu Guang: Yes, no feeling. This time I did not create the impact, it was the media. When I shot them I followed my own ideas to take the pictures, to do a good job, so that more people know the truth. What you said impact is because netizens are concerned; very concerned about the pollution issue in China, which shows that Chinese people are very concerned. (Key: I wish he know about ChinaHush and see how many people from other countries were more concerned) This is everyone’s life, environmental issues, the earth is everyone’s, is human’s therefore everyone was very concerned. NetEase: What role do you think W. Eugene Smith Grant in Humanistic Photography played? Lu Guang: Eugene Smith is a photographer, an American. In the 70’s he took a set of photos on the mist in Japan which changed Japanese people’s view on environmental pollution issues. In the 70’s Japan also had terrible pollution problems. Because of the social impact of this set of photos, they completely changed the Japan’s environmental pollution problems. They carried out this award, I thought maybe this set of my photos were similar to his. As for this award, I think there are 2 points. One, it recognized my work in the past years. Two, this set of photos will attract more people’s attention worldwide. NetEase: Are you now the first person to know information on the pollution situation in the villages? Lu Guang: Yes, my information comes very fast, because they will call me, and if I want to know information about a particular place, I can call them to find out everything. But I want to say one thing, actually the pollutions I documented was only a very small part in China. There are many places I did not discover and did not take photos of, therefore I have many work to do. Now what I did was three rivers, Huai River, the Yangtze River and Yellow river. But there are Hai River, Liao River, Songhua River, Pearl River, these four rivers also were heavily polluted, I still did not go there yet. Because the power of one person is limited, time is limited. Maybe my focus of future work will be those. NetEase: Looking forward to more of your work. 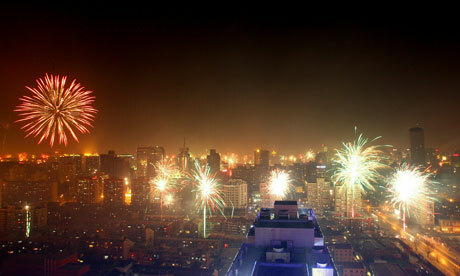 Excellent photos and vivid reminders of the backside of China’s progress. We can’t get enough Lu Gangs in the world. The photo of the old herder covering his face with his hand is truly memorable. Great. And the comparison with Japan in the 1970s gives hope – Lu Guang may change China for the better. Unfortunately I think the problem in China is exacerbated by the problem of a one-party state, where the government wants people to see glittering Olympics displays, space walks, and the beautiful robots of the 60th birthday parade – but not the dark side of all of this. If you try to hide your shadow too long, it will come back to bite you. Sorry, typo, missed “not” in my above comment. chinabox, you’re a spammer. Your link leads to a sales site. If this is not an honest mistake you have no face. It is the greed of such people that make false promises of benefits is the beginning of the atttitudes that become callous disregard for polluting the homes of others. You have just wasted some of my time. How long till you waste a life through your actions? Will your greed continue to grow and make you richer to build a factory that spews filth into the air that people breathe and poison into their homes? I wish Chinese people would go back to caring about people and stop talking about it all the time and giving false friendship in exchange for monetary rewards. China, wake up and don’t follow our greed and don’t make the same mistakes we did. Show us how to succeeed without pollution. Show us how to care for others. You are killing your people in so many ways. Be like Lu Guang who everyone can admire because he cares about his billions of brothers and sisters. that effects the entire world. We invite all passionate of photography and admirers of Lu Guang to come see his first ever exhibition in a gallery. We have renamed his Pollution series into REQUIEM for MOUNTAINS & WATERS. Truely, a face-to-face with real size pictures printed on watercolor fine art paper and displayed without glass is a moving and chilling experience. 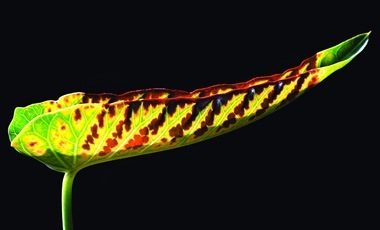 The exhibition will last from November 21 to January 20 of 2010. You are most welcome. Reflecting the promblems of the country is the resposibility of a photo journalism. LuGuang is admirable and what he did has deep impact in the society. Being stunned at his spirit and attactment to photograph also the serious attitude to the pollution, I feel that he is a great photo jurnalism! The info right here is grea. I’ll invite my pals right here. Great photos as they tell the stories. Lu Guang has the vision and morals to expose the environmental pollution that not only destroys China but also affects neighboring countries and the world. Kudos for the great work Mr. Lu Guang. You’re the mouthpiece and a shining light in this world. 1) One mistake in the translation of the NetEase interview: Eugene Smith has photographed the mercury poisoning problem, not the “mist” in Japan. 2) I presented Lu Guang’s Pollution in China at the 4th Edition of Yangon Photo Festival in January 2011 and Lady Aung San Suu Kyi came to view it, she said: “we don’t want that in Burma”. 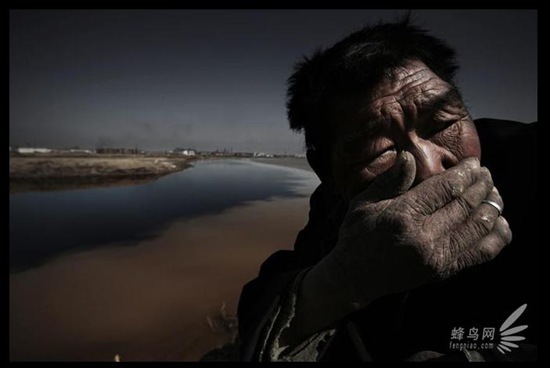 3) Lu Guang is still carrying on with his 10-year project of documenting the pollution of the 7 major rivers in China. At the same time he works on specific projects with Green Peace and personal projects such as the handicapped orphans fostered by poor farmers. 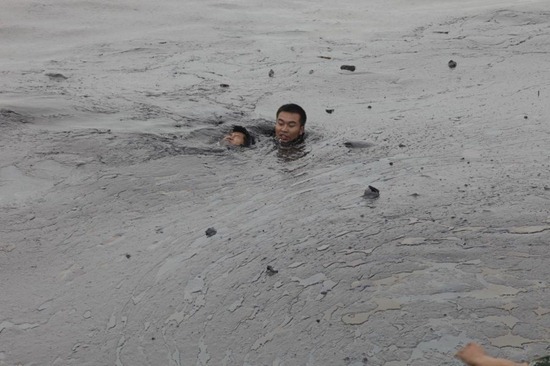 4) After winning the 2009 Eugene Smith Grant for Humanistic Photography, Lu Guang went on to win the 2010 National Geographic Photographic Grant and in 2011 he won his second prize with World Press Photo for the story of Dalian oil spill. From Beaugeste Gallery, Shanghai, the first and only gallery exhibiting and representing Lu Guang’s Pollution in China.